Lunchtime is a key moment in any conference, and not just for hungry delegates. Conference organisers tend to focus on the crucial ten minutes after lunch and before the afternoon sessions begin – because this is when they find out whether they’ve succeeded or failed. 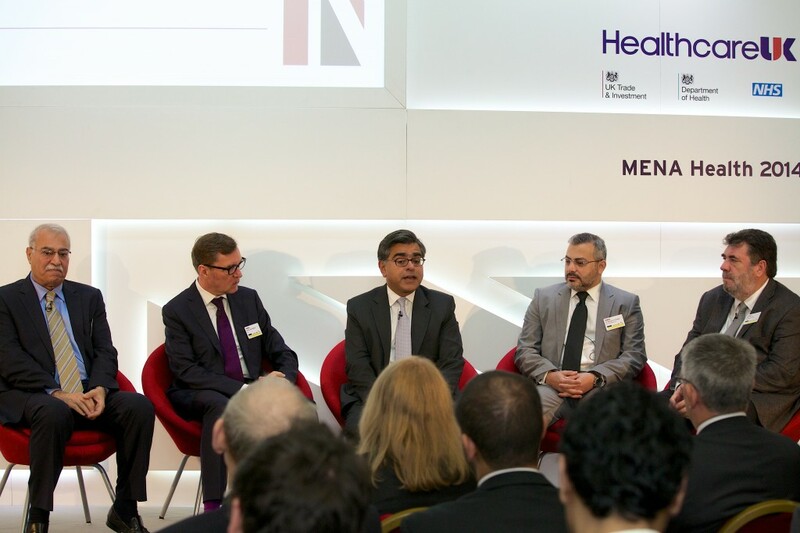 An undeniably healthy number of delegates – more than 250 – registered for this year’s MENA (Middle East and North Africa) Health 2014 conference, hosted by Pathfinder and Healthcare UK this month in the magnificent surroundings of Lancaster House in central London. But as any conference organiser will tell you, no matter how many delegates turn up in the morning, it’s not until you see how many of them return after a hearty lunch that you can be sure that you’ve invited the right people, and that you’re giving them the information and contacts they want. I can’t exactly say that I counted them out and counted them back in again. However, as a member of the team working to introduce the cream of the UK’s healthcare providers and managers to key policy makers in the MENA region, I was delighted to see that at 2pm no yawning gaps had developed in the ranks. So while we were more than pleased to be able to invite our delegates to a venue as prestigious as Lancaster House, once part of the ancient Palace of St James, I think I can feel fairly sure they were drawn there by rather more than location. If there was one issue at the forefront of everyone’s minds on the day, it was the sense that healthcare, like the economy, has truly become a global issue. Of course, because of devastating health threats such as Ebola and avian flu, neither of them respectors of international boundaries, there is a growing understanding of this even among the general public. The professionals at the MENA conference, however, have been clear for some time that modern healthcare systems have to confront this new form of globalisation head-on and build it into their planning. No longer can any of us pull up our national drawbridges and hope to insulate ourselves from a specific health issue. The enthusiasm among MENA 2014 delegates for more and better international cooperation and exchange of expertise was almost palpable. We heard, for instance, about links already established between The Leeds Cancer Centre, Yorkshire, and the King Hussein Medical Centre in Jordan. Cancer specialists there and here consult regularly with each other by video, sharing expertise – and it was made clear that the learning process travels in both directions. Not only do MENA countries such as Jordan benefit from the medical, organisational and medical expertise of our NHS, but links like these give our own doctors access to a much wider range of diagnostic experience – and that can only be good for patients in Britain. The inspiring and reassuring message was that, with the help of new technology, experience can travel just as fast as the most challenging health issues. And it was made clear that the UK and the MENA region face common challenges. Our shortages of qualified physicians and allied healthcare staff here in the UK may be less acute, but experts speaking at the conference breakout sessions made it clear that all governments, all over the world, need to find innovative ways to recruit, train and hang onto able healthcare professionals, whether local or expatriate. Again, while we have a modern healthcare infrastructure, the NHS is no stranger to the need to lever as much capacity as possible out of a constrained budget. Afternoon sessions about infrastructure and hospital management were standing room-only, demonstrating the appetite for British expertise in these aspects of healthcare. Medical specialists sat side by side with health facility architects, quality delivery experts, business ambassadors and leading management practitioners. The day was an impressive display of what the UK can offer developing countries that are striving to give their own people better health and quality of life. We got over the first hurdle of the lunch break. But we’ll only be able to say emphatically that the day was a success in a year or 18 months, when we see how many UK experts have forged new and lasting links with their opposite numbers in the MENA region. I suspect there’ll be more than a few.